Search Results for "Flying Fish"
Inflatable flying fish at sea. 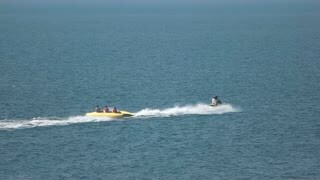 Jet ski in slow-mo. Sea background with flying fish. 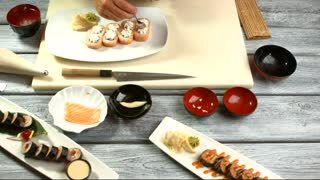 Hand puts caviar onto sushi. Plate with small sushi rolls. Flying fish caviar and rice. Traditional japanese dish with wasabi. A flying fish, Exocoetidae, leaps from the water and soars just above the surface of the ocean before splashing down into the clear blue water. Sushi roll rotated on black background. Sushi japanese food in restaurant. 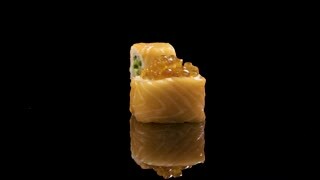 Sushi roll set with salmon, vegetables, flying fish roe and caviar closeup. Japan restaurant menu. Na Pali Scenic Coast Moving Boat Flying Fish Kauai Hawaii 4K 1569. Na Pali coast with mountain cliff steep into water. Kauai is the oldest Hawaiian Island. Garden Isle. Economy is tourism based. Drone footage of 2 boats towing flying inflatable water sled (or flying fish) getting ready for the next ride over the shallow reefs in the south of Serangan island. The camera is facing Nusa Dua and is going towards the two boats. Drone footage of a boat towing flying inflatable water sled (or flying fish) going over the shallow reefs in the south of Serangan island. The camera is facing down at birdview angle showing the flying inflatable water sled. Drone footage of a boat towing flying inflatable water sled (or flying fish) getting ready for the next ride over the shallow reefs in the south of Serangan island. The camera is facing the boat with its flying inflatable water sled stopped. Drone footage of a boat towing an flying inflatable water sled (or flying fish) over the shallow reefs in the south of Serangan island. The camera is following a boat with its flying inflatable water sled just starting for the next ride. Drone footage of a boat towing an flying inflatable water sled (or flying fish) over the shallow reefs in the south of Serangan island. The camera is turning around a boat with its flying inflatable water sled stopped getting ready for the next ride. FLYING FISH FOUNTAIN. Slow motion close up of water cascading down. Shot at 180 fps. PHETCHABURI, THAILAND - JANUARY 3:Jet ski pulling banana flying fish boat with tourists having fun on it at Cha - am (the famous seaside resort in Thailand) on January 3, Thailand. Hand held shot. Paddle Boarder coming into focus, kneeling and paddling out to sea. Sea birds flying. Fish farm in distance.